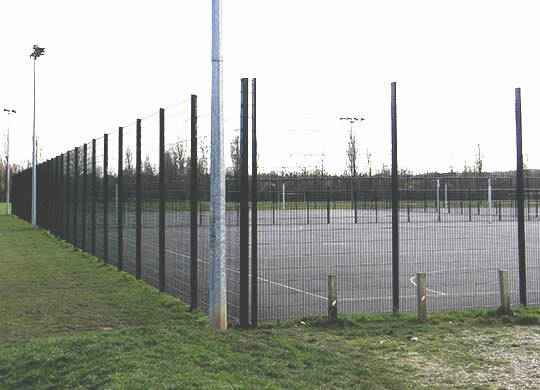 Countrywide Fencing Ltd. supply and install a wide range of sports venue fencing, from individual tennis, netball and basketball courts, to full size hockey and football pitches. Our product range includes chain link and MUGA (multi use game area). The latter provides a heavy duty and robust mesh, which is anti-vandal tamper proof and provides a durable, long life fencing option. Our versatile sports fencing can be built to your exact size and height specifications to suit your needs, from amenity areas and schools to professional sporting facilities. Our bespoke service can cater for all your needs, from ball stop boundary and roof netting to high impact twin wire rebound fencing, providing sturdy, practical sporting solutions which offer unobscured spectator views. We also ensure all our sports products are finished to the highest standard taking into account the relevant sporting bodies’ recommendations and regulations.